The email signature channel can be of tremendous benefit to organizations when used correctly. Unfortunately, too many leave signatures in the hands of their users or don’t think about ensuring everyone has a uniform design. So, what can you do? 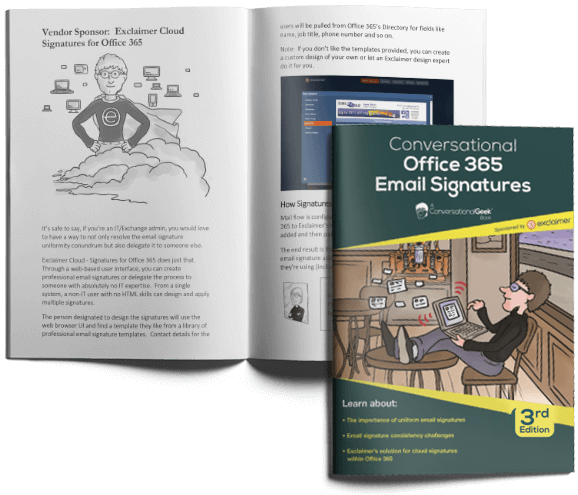 Well, you can start by getting your free copy of Conversational Office 365 Email Signatures written by the renowned Microsoft MVP, J.Peter Bruzzese, and sponsored by email signature management experts, Exclaimer. All you need to do is fill in the simple form to learn more about the importance of consistent Office 365 email signatures, the challenges you might face and how a third-party solution can help. Do you spend too much time on email signature management? Want high-quality HTML signatures on all devices including mobiles and Macs? Well, let Exclaimer give your company the Office 365 email signature it deserves! Exclaimer is totally committed to your privacy and will never share your information with third parties.